Debbie & Stevie are two of the most incredible bunnies you will ever meet. These two are FULL of personality, there will never ever be a dull moment when these two are around. Debbie has a sweet and gentle nature, she will cuddle with you all day. Stevie is more adventurous and outgoing, he will cuddle, but not for as long as his sister and then he will be off bouncing around the room keeping you entertained with his hilarious antics. These two are brother & sister and are the absolute best of friends. They must be adopted together. 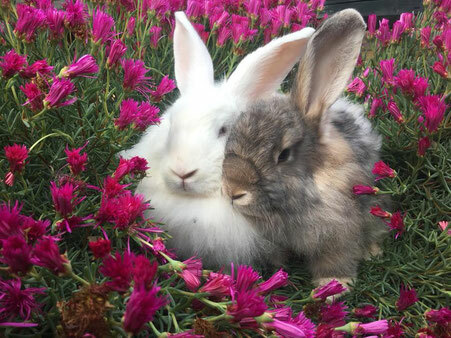 Given they are both French Angora, they will need extra care with their luscious locks. Debbie keeps her fur looking fabulous and usually tangle free but Stevie is not so great with his grooming so he will need regular brushing. During the warmer months shaving is often necessary to ensure they don't over heat. These bunnies are best kept indoors out of the elements as it will keep their fur from getting into as much of a mess. If you are interested in giving Debbie & Stevie their perfect forever home, please message Furry Friends Forever Rescue to complete our online expression of interest form.